You think you can work in a fire-breathing chicken? (SPOILERS) Laika studios have received much acclaim for their undoubtedly first-rate stop motion animation technique, but I’ve tended to the lukewarm on their output’s overall quality. Coraline was a strong feature debut, but both ParaNorman and The Boxtrolls came up short for me. Kubo and the Two Strings represents a significant uptick, one that shows off a mastery of tone and atmosphere, but it also suggests Laika still need to beef up their script department. Kubo’s a movie about the power of storytelling that ironically exhibits significant deficiencies in storytelling, and an animation about the power of intergenerational forgiveness that fudges the delivery, but the sheer technical artistry on display is something else, imbuing a lyrical, dream-like quality that far exceeds the scope of their last couple of pictures in depth and resonance. Kubo (voiced by Art “Rickon Stark” Parkinson) is a master storyteller, holding his village rapt with unfinished tales and magical origami, which he introduces with the warning “If you must blink, do it now”. But his real tale is one of familial abuse in which his grandfather took one of his eyes and is intent on taking the other, such that his mother Sariatu (Charlize Theron) fled with him. When Kubo goes out after dark, against his mother’s instructions, Sariatu’s creepy flying sisters Karasu and Washi (Rooney Mara) find him – reminiscent in style of A Chinese Ghost Story – and he must flee again, this time on a quest to find his samurai father Hanzo’s protective armour, accompanied by a miniature, origami version of his dad to guide him. That, and a made-flesh snow monkey as his protector. Along the way, Beetle (Matthew McConaughey) joins them, a samurai trained by Hanzo who has lost his memory and been turned into a part-stag beetle. Monkey: Magic is not supposed to be easy. It needs dedication. There’s a danger in using magical and fantastic devices in stories in that the temptation is to assume anything goes. Kubo’s powers come from his mother, of the lineage of the Moon King (his grandfather). It isn’t abundantly clear what exactly the Moon King is or does, other than having beefs with samurais and wanting to extract his grandson’s eyes (to make him immortal, or to divest him of empathy for others, such that, unable to see into the windows of their souls, he will become cold and callous – a wonderful message for blind people everywhere to take away there). The Moon King isn’t human, but he becomes human at the end in a rather confused, if undoubtedly nobly-motivated decision on the part of writer-director Travis Knight and his co-scribe Arianne Sutner. The idea is one of forgiveness, but it rather serves to embrace the healing power of lies as the defeated, amnesiac old man is allowed to rest easy in his dotage, with Kubo and the entire village telling him what a wonderful fellow he is. So what’s the message here? Forgive and forget? Who does that serve? How does one learn or atone if one considers it acceptable to leave perpetrators under a veil of illusion? It’s additionally curious that Kubo pulls its punches, having been so upfront in leaving its title character bereft of both his parents – the picture’s a dark one, both thematically and atmospherically – by presenting him with the consolation of their Force ghost incarnations to comfort him (apart from anything, when he says “I still need you”, we can’t help but feel he doesn’t actually, and this is a sop from filmmakers who have lost their nerve at the final hurdle). Washi: You’ve been together all this time and haven’t even realised? There are other questions too, such as why Monkey/Sariatu (one of the reveals is that she considered it best not to tell her son she had used magic to become Monkey, for reasons that don’t entirely connect) doesn’t recognise Hanzo (I’m assuming his face hasn’t changed), why/how/when Hanzo hid his armour, particular since he was preparing to go and find it, and why Hanzo was cursed rather than killed as originally planned. To an extent, none of these are deal breakers, and the picture is sufficiently invested in its own abstracted milieu, in a Wizard of Oz fashion (I was half expecting the entire story to be revealed as a story within a story), that they don’t largely, significantly, detract, but you’re left with a nagging feeling that Travis and Sutner were entirely laissez-faire with notions of internal logic. The picture’s take on existence and the hereafter is a bit of a patchwork too, in which, we are told, when we die we shift and transform “so we can continue our story on another plane” (apparently the one Ben Kenobi goes to). Meanwhile, the Moon King, in whatever realm he exists (non-corporeal, it seems) warns Kubo that if, he doesn’t give up his eye, “You’ll be stuck down here, in this hell” to which Kubo replies that for every terrible thing down here there’s something far more beautiful, which at least strikes a marginally optimistic note, if not an outright denial. The voice cast serve the story extremely well. Theron’s suitably stern and serious, while McConaughey is having a whale of a time, pitching his delivery somewhere between Buzz Lightyear and Patrick Warburton, served a succession of hugely winning comic relief lines and moments. There’s also the very wise advice that Kubo should include a chicken in his story (“The chicken is funny”), something Moana astutely lived by. The character design work is sympathetic and evocative, eschewing the tendency to the grotesque of previous Laika offerings. Dario Marianelli’s score is a beauty (if the visual effects deserved an Oscar nod, the score did even more so). 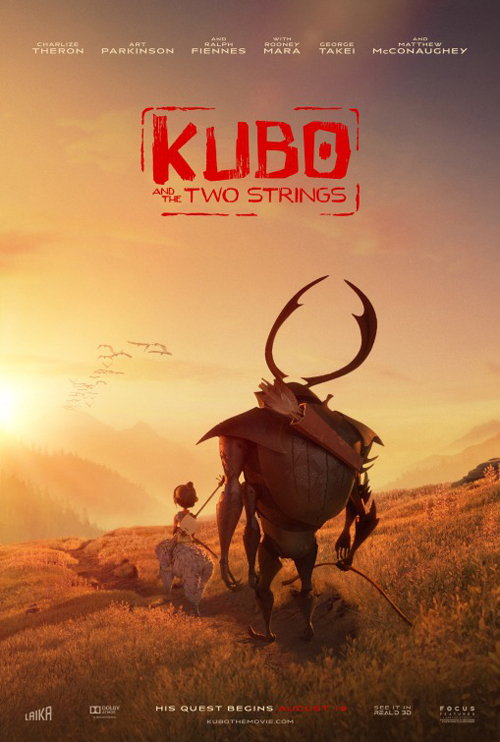 With a bit more work and a few more drafts, Kubo and the Two Strings (not a great title) might have been the masterpiece many have acclaimed it to be. Which makes it sadder that the box office response was tepid at best. These pictures don’t come cheap, and there just doesn’t seem to be the same appetite for them as their crowd-pleasing CGI big studio cousins. Still, Laika aren’t over with yet, with another animation due next year. Knight, however, the production company’s president and CEO, has hitched his cart to a bereft franchise, signing up to direct Transformers spin-off Bumblebee. Somehow, I don’t think “depth” will be thrown around to describe his live-action debut.